On the “ridge of the escarpment of the Paderno plateau” – where Leonardo, enchanted by the beauty of the place, catches inspiration for his paintings from the scenary of the river – it was built the first electrically driven mill in 1882. The Colombo family succeeded the founder, Federico Wyttenbach, in the early of the 20th century, and turned the mill into a modern industrial reality whose brand name would become famous for the quality of its flour. 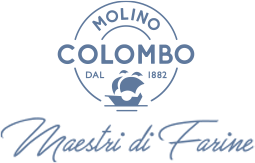 Today, after a century of premium quality tradition, Molino Colombo remains a landmark for those who consider excellence the target to pursue. The use of the best grains is essential in order to stay at the top of an extremely competitive market since the secret of the Colombo’s flour derives from the excellence of the selected wheats which are milled with techniques that combine the modernity of the machinery with an ancient skill in using it.